Vladimir Kramnik retained his slim lead over Veselin Topalov with a six hour, 60 move, draw in the seventh game of their World Championship match in Elista, Russia. It would be good to be able to claim that most of the action was on the board on Wednesday in Elista, but it seems that Team Topalov are determined to create controversy no matter how badly their actions are playing in the outside world. 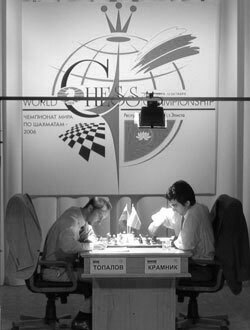 After game six it seemed that both players had decided just to play chess and forget about the acrimony of the previous days, with Topalov at the post-game press conference notably contrite that he had threatened not to shake his opponent's hand nor attend joint press conferences. It took less than 24 hours for Topalov's manager Silvio Danailov to turn up the heat, producing a provocative press release which claimed that 78% of Kramnik's moves tallied with the first choice of the computer program Fritz. As usual, Danailov made no direct allegation that Kramnik was cheating but the insinuation was clear. Is 78% a high correlation between a top Grandmaster and a computer program?I doubt it but the effect of Danailov's paranoia about Kramnik receiving computer help seems to be having more effect on his own charge than on Topalov's Russian opponent. Topalov had also changed his tune: "[Kramnik and I] are not friends and I'm not going to pretend that we are friends. We are rivals." Through all this, Kramnik appeared unperturbed. "I am ready – indeed I anticipate – any sort of dirty tricks from my opponent." Returning to the game, Kramnik was quietly confident – his critics might say arrogant. "After the opening, Topalov had an excellent position and an extra hour on the clock," said Kramnik at the post-game press conference. "Then I just outplayed him completely!" Inviting Kramnik to move from a Slav Defence to a Queen's Gambit Accepted, an invitation which Kramnik is happy to accept. Kramnik is considered a master of this line with the White pieces, having defeated a player such as Anand three times. One would expect that he would also know how to defend with Black, yet here he gets into trouble quite quickly. Kramnik had preferred 12.a3 against Anand (and was also successful with 11.Bg5) but the text move is psychologically well founded, cutting out Black's counterplay with ...b5. A rather passive manoeuvre. Kramnik would know as well as anyone whether to be scared of 12...b6 13.d5!? but the …Bd7-e8 manoeuvre makes White's play very easy. This was no doubt the position Kramnik was talking about at the press conference – with an hour up on the clock and excellent attacking chances, one would have expected a player of Topalov's calibre to put enormous pressure on his opponent. Yet 20 moves later Topalov finds himself losing a pawn and grovelling for a draw. Sacrifices on f7 are in the air, so Black is forced to concede the bishop pair to keep his position solid. By now most commentators believed Kramnik's chances to be grim – only his superb defence in earlier games gave hope to his supporters. Kramnik was far more concerned about 23.Bd2. when 23…Bb4 might walk into a sacrifice on f7. Mistakenly believing that he will have ample time to build up an attack at a time more to his liking – or more particularly when Kramnik was running into serious time trouble. (Kramnik was already down to 20 minutes on the clock to reach move 40.) However Topalov should have taken his chances and played 25.g4!. Now Kramnik is allowed to consolidate completely. After 27.Bc4, White can at least avoid any of the queenside counterplay which causes him so much trouble later. 27...Bxe5! 28.dxe5 Rxd1 29.Qxd1 Nfd5 30.Bd2 Rc5 31.Qg4 Nf5 32.Qe4 b5! 33.h5?! Closing the position with 33.a5 would avoid the coming b file problems. 33…bxa4 34.Qxa4 Rb5 35.Rc1 Qb7 36.Bc2 Nb6! Topalov had played the entire game very quickly but here started to think deeply, perhaps only now realising that his once-great position had deteriorated dramatically. Kramnik now wins a pawn, although the bishop pair provide great insurance against loss. Had Kramnik been a true Fritz devotee he would have chosen 37...Nd7! but perhaps he didn't want to look guilty!? 38.Be4 Qd7 39.Be1 Nd5 40.Bd3 Nb4! Now with the time control reached, Topalov thought until he almost caught up on the clock with Kramnik. The time was well spent finding a second pawn sacrifice which gives White enough pressure to hold the game. Self-pinning the knight would be asking for trouble but now White wins the f pawn, after which most of his problems are over.